Designed to bloom during the day and close at night just like most real flowers do, Floralis Generica is a beautiful metallic sculpture that popped up in Buenos Aires back in 2002. 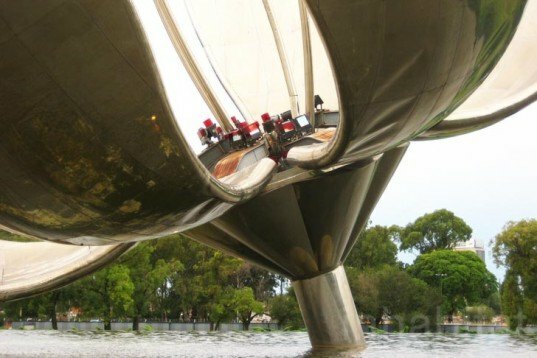 The amazing aluminum and stainless steel art piece was created by Argentine architect Eduardo Catalano. Measuring 20 meters high Floralis Generica is the city's first mobile sculpture and is controlled by a hydraulic system and photocells. 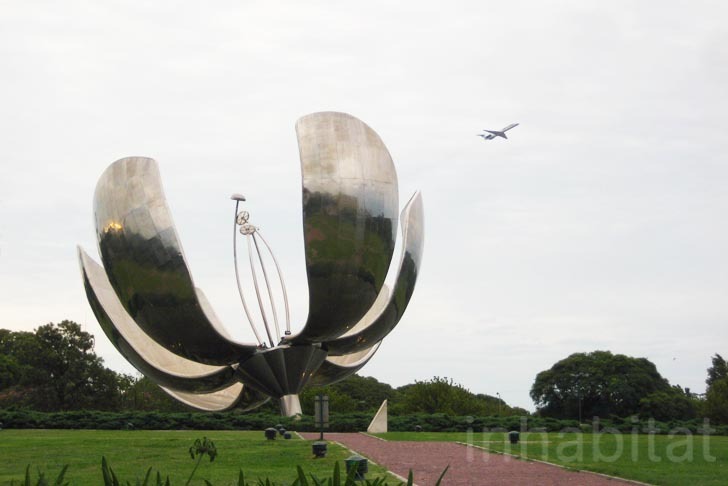 Located at Plaza de las Naciones Unidas (United Nations Park), the flower’s surrounding park area is well looked after by the local government and the Tetra Pak Foundation. Its stark modern image creates a cool contrast with the neo-classic style of the law university behind it. Standing within a round pond full of water, Floralis Generica opens to reach a whopping 40 meters in diameter. Made from 18 tons of aluminum and stainless steel that offers amazing reflections of the city, the environmental artwork was manufactured by a Cordoba branch of Lockheed Martin Aircraft. Through hydraulic mechanics and a series of photocells, the 13-meter long petals were designed to open at 8am and close during the evening each day. Born in Buenos Aires, the late architect Eduardo Catalano was taught by Walter Gropius in Harvard and was a professor at Massachusetts Institute of Technology (MIT) at the end of his career. At the moment, the flower is sadly broken, but a park ranger kindly allowed us underneath the pond to check on the hydraulic mechanisms. We hope to see it fixed soon! Located at Plaza de las Naciones Unidas its surrounding park area is well looked after by the local government and the Tetra Pak Foundation. Its stark modern image creates an adorable contrast with the neo-classic style of the Law University at the back. Standing within a round pond full of water, when Floralis Generica opens it can reach a whopping 40 meters diameter. Made from 18 tons of aluminum and stainless steel that offers amazing reflections of the city, it was manufactured by a Cordoba's branch of Lockheed Martin Aircraft. Through hydraulic mechanics and a series of photocells in its center, the 13-meter long petals were designed to open at 8am and close during the evening each day. Born in Buenos Aires, the late architect Eduardo Catalano was taught by Walter Gropius in Harvard and was a professor at Massachusetts Institute of Technology (MIT). At the moment, the flower is sadly broken, so we hope to see it fixed soon!